Elmore House, the location of EDF's blockchain P2P network trial. Image: EDF Energy. An EDF Energy-backed community energy trading pilot is to start next month, allowing residents of a Brixton estate to trade solar energy between each other. Project CommUNITY, as it has been dubbed by EDF’s R&D division, will see the French energy firm collaborate with community renewables firm Repowering London and University College London’s Energy Institute to enable peer-to-peer trading of locally-generated power. 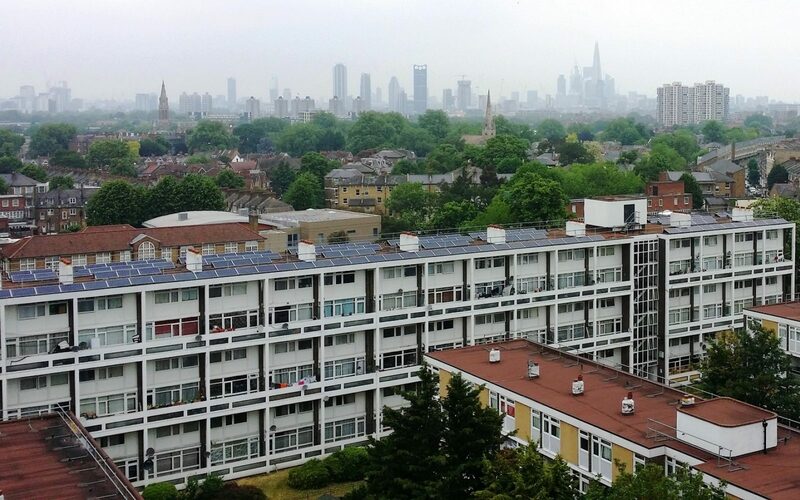 Residents of Elmore House in Brixton, South London, will be allowed to access electricity generated from a rooftop solar system installed atop the estate, store it in a domestic battery unit and trade it amongst themselves. Those energy trades will be enabled using blockchain technology, and a consumer-facing app has been produced to allow residents to access the trading platform. Current± first mentioned the project back in July 2017, when Ofgem revealed it to be one of a number of projects the regulator was looking to include within its Regulatory Sandbox. That mechanism, which falls under Ofgem’s innovation link, allows certain projects to operate outside of the usual regulatory confines provided they can demonstrate a tangible benefit to consumers and/or the energy market as a whole. Under current regulations customers are only permitted to purchase electricity from a single party, essentially prohibiting the development of peer-to-peer trading networks. However Ofgem is known to be considering changes to the regulatory framework as the power sector evolves. Xavier Mamo, R&D director at EDF Energy, said the firm was committed to unlocking the benefits that new technologies stand to bring to the sector. “By collaborating with our partners and using blockchain technology, this project in Brixton aims to show how small communities in dense urban areas could benefit from a low carbon and local energy system in a new and transformative way. The trial is to start next month and conclude in October 2019.